There is something admirable about tackling projects yourself. Not only can you save a little money, you can experience the pride of a job well done. However, there are times when it’s best to leave it to the professionals. If you’re planning a commercial move and you’re deciding whether to go it alone or hire a relocation company, then take some time to carefully evaluate your needs. If any of the following apply to your move, then hiring reliable movers is a must. Do you have fragile and high-value electronics, furniture, artwork, or other items that you simply cannot risk losing? If so, professional movers will make sure each item is carefully packed, loaded, unloaded, and delivered. You can also benefit from valuation insurance! Long distance moving requires detailed planning and careful management throughout to ensure your belongings arrive safely and on-time. Interstate moving professionals will create a custom moving plan that ensures your needs and budget are met while promptly handling any concerns that arise along the way. 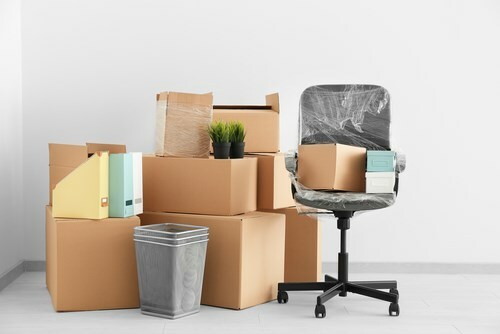 Whether you are the employer or the employee, moving for business reasons usually means sticking to a strict timeline, budget, and other relocation requirements. You have enough to focus on when relocating for career reasons without dealing with theses hassles. Let trusted relocation experts take care of the details for you! You need reliable delivery services. Maintaining an efficient logistics chain is critical for the success of your business. Some commercial moving companies offer local delivery services that are seamless and secure, always keeping things moving steadily while ensuring your customers are happy! You’re moving on a strict timeline and budget. There is much room for costly error when managing a commercial move. If your relocation needs to be efficient, safe, and affordable, trying to handle the job alone will almost always backfire. Professional moving and storage experts have what it takes to ensure your move is always right on time and within your budget. When you need commercial movers you can trust, consider 496 Moving and Storage. We are a BBB-accredited business that has provided high-quality and reasonably-priced services since 2009. We provide a variety of service options to meet your individual needs. Get started with a free, no-obligation cost estimate!